Many of you may have been following the news of the recent elections in Kenya in January that caused horrific riots, violence, and hundreds of thousands of displaced people. We wanted to share the great news that some funds from Mocha Club have been designated towards the relief of the Kenyan people! Thank you for helping us care for our brothers and sisters in Kenya. This article explains the background on the violence that erupted after the election. The bloodshed exposed tribal resentments that have long festered in Kenya, where Kibaki’s Kikuyu people – the largest group – are accused of turning their dominance of politics and business to the detriment of others. Defeated opposition candidate Raila Odinga and his supporters said the vote was rigged, and Raila Odinga called for nationwide rallies. Raila is a member of the Luo tribe. International observers, representatives from England and the USA indicated irregularities in the election that warranted investigation. GOOD NEWS! As of February 28th, it was announced that the two parties had come to a peaceful agreement! The new coalition will be headed by President Kibaki, with Raila Odinga in the position of Prime Minister. At the peak, there were about 600,000 displaced people in Kenya as a result of all this political unrest. African Leadership, Mocha Club’s parent organization, and Mocha Club have partnered with our national director in Kenya, Benson Mutisya, and several local churches and relief organizations to provide relief in the form of desperately needed food, household products, blankets, transportation, and security fencing for an IDP compound. We have a plan for helping with the continued relief over the next few months, not only for those who have fled their homes but for people trying to remain in the Kibera slum of Nairobi where AL has been working for the last 15 years. 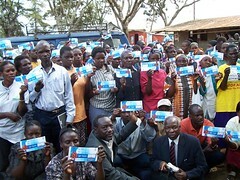 Here are some photos from a distribution of food coupons for over 300 HIV/AIDS victims in Kibera, Kenya who were affected by the post-election violence! 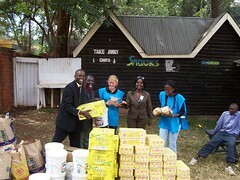 The coupons work very well with people in Kibera due to security issues when distributing food items. See more photos of the relief distribution in Kibera. And we are going to continue in the relief. Unfortunately, one of the churches we support in Kibera, Emmanuel Presbyterian, was burned, but it is being rebuilt. African Leadership is committed to building a vocational training school and a nursery there as soon as the church has been repaired. HOW DOES THIS AFFECT OTHER MOCHA CLUB PROJECTS? Unfortunately, what has happened in Kenya has affected other Mocha Club projects…specifically those of you supporting Sudan Regrowth & Orphan Care. The sterile surgical unit in Sudan has been put on HOLD because of what has gone on in Kenya. Because of Sudan’s instability and Kenya’s former stability, all the building supplies came from Kenya. Now, a truck that originally delivered for $10,000 is charging $25,000. It’s Africa’s reality right now. The Boys’ Dormitory is moving forward now! Please pray with us that these projects can successfully continue!